** UPDATE ** Connection issue on iOS 4 has been fixed. Please update the app to the latest version. 7/3/2010. 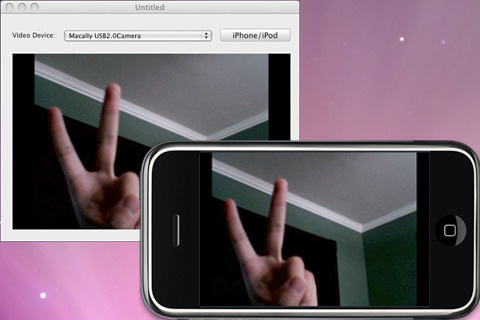 When hooked up with an external webcam, you can even turn Air Cam into a home surveillance system. Simply point your webcam to the location you want to monitor, and receive live video feed on your iPhone/iPod Touch. You can even set up motion detection that automatically triggers email and video recording. * Take snapshots of the video feed and save them into iPhone’s photo library. 1. A desktop or laptop running Mac OS X 10.5 Leopard (previous OS X versions are not supported) or Windows XP/Vista with compatible internal or external webcam. 2. A shared Wi-Fi network between your Mac computer and your iPhone/iPod Touch. Air Cam also works with Edge or 3G networks with port forwarding of TCP port 1726. 3. Download and run the free Mac or Windows software from http://www.senstic.com/iphone/aircam/aircam.aspx to stream your video feed.